IFI Mag is published by the Association of Food Scientists & Technologists (India). 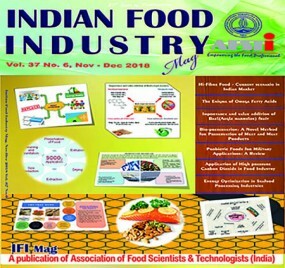 Indian Food Industry Mag (IFI Mag), a bi-monthly technology and trade journal, has been serving the information needs of food professionals in India since 1981. With its reviews on recent development in the area of Food Science & Technology and Engineering, informed views on industry related issues and wide coverage of market developments, IFI Mag has established a large readership base. The spectrum of readers include food technologists, engineers, scientists, managers, consultants, policy makers and students. IFI Mag Editorial Board consists of researchers, academicians and representatives of industry. The amalgamation of experts from the above three key sectors provides IFI Mag an opportunity to have a holistic view. In its effort to be in tune with the needs of industry and to meet the aspirations of the readers, IFI Mag undergoes restructuring on a continuous basis. Academy Degree and PG College, Old Alwal road, Secunderabad-500010, Telangana, India.